Enjoy Your Next Occasion at Wild Flower Restaurant! 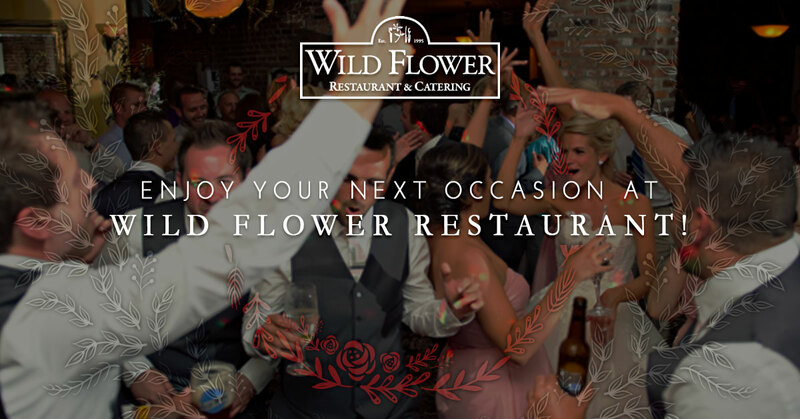 Here at Wild Flower Restaurant & Catering, we believe there’s always something to celebrate. Did you finally leave the office at a normal hour? Then you absolutely deserve a happy hour with coworkers. On the other hand, maybe your parents are in town and you want to take them out for a nice Saturday brunch. Whatever the occasion, Wild Flower is here to help you celebrate. Let’s take a look at some of what we have to offer. Who doesn’t enjoy an incredible brunch? If you’re in the mood for something savory, we recommend our popular breakfast wrap. Dig into free-range scrambled eggs, bacon, and cheddar all rolled in a sundried tomato tortilla and served with breakfast potatoes. Perhaps you’d prefer something sweet instead. If you’re nodding your head ‘yes,’ then consider our always popular apple walnut pancakes. Granny Smith apples and walnuts are mixed into the batter and griddled to perfection. What would brunch be without mimosas or a delicious Pepper Mary? Your visit to the Wild Flower will be the highlight of your weekend. Stop by for brunch in St. Louis from 9 a.m. to 3 p.m. Tired of the same boring lunch places in town? Then it’s time to mix things up at Wild Flower Restaurant! Begin your meal with a shareable such as goat buster fondue, chicken quesadillas, or calamari fritti. Then move on to your choice of salad, pasta, or sandwich. Our golden chevre salad features organic mixed greens, fresh berries, candied walnuts, and julienne apples accompanied by a strawberry poppyseed vinaigrette topped with panko crusted chevre. If you’re more in the mood for a burger, then ask a server about ours, which is grass-fed and comes with your choice of fries, fruit, or side salad. Stop by Wild Flower today for lunch from 11 a.m. to 4 p.m. Think back to the last time you treated your family to dinner at a gourmet restaurant. Can’t remember? Then make plans to enjoy a meal at Wild Flower Restaurant! Crowd favorites include entrees such as garlic chicken, basil butter chicken, best filet, and our bistro burger. For pasta lovers, we recommend the cajun seafood risotto. We know you’ll enjoy every bite of the braised peppers, gulf shrimp, and scallops. Should you save room for dessert, you can pick between the scrumptious flourless chocolate torte, caramelized bread pudding, or cheesecake. We pride ourselves on offering the best happy hour in the Central West End. Stop by Monday-Friday after work and enjoy $3 domestic bottles and $3.50 seasonal drafts. Wild Flower also offers $6 appetizers such as chicken nachos, spicy sesame wings, and apple walnut and Gorgonzola pizza. Need to wind down with a glass of wine or cocktail? We even have deals on Manhattans, Old Fashioneds, Cabernets, and Chardonnays, just to name a few. As you can see, Wild Flower Restaurant is the perfect spot for any occasion. Stop by today!